Memories of war: Ralph Hickey at Sacred Heart Church, Toowoomba, where he is a parishioner. Photo: Nancy Webb. RALPH Hickey knelt in the kitchen and sent a desperate plea to heaven as the Japanese advanced towards Australia. It was 1942 and Ralph was 12 years old. Japanese forces had bombed Pearl Harbour and an invasion fleet was heading for Papua New Guinea. With American bombers flying overhead and the Allied fleet gathering in the Coral Sea, Ralph and his family turned to the greatest weapon they had: prayer. “We all thought the (Japanese) were going to get us,” he said. In the first week of May, the Japanese and Allied forces closed in on each other 800km north-east of Australia for what would be known as the Battle of the Coral Sea. There was no official plan to invade Australia, but the Japanese wanted to cut off Australia’s supply line to America by establishing bases on the Pacific islands. A two-day airstrike between the fleets began on May 7. Both sides suffered moderate losses, but the Japanese advance was stopped for the first time in World War II. During the war, Ralph lived with his parents and five siblings in Theodore, a town of 200 people south of Rockhampton. He said his father, John Hickey, was especially worried about the Japanese advance because he had seen the horrors of invasion when he was a stretcher-bearer in World War I. “He’d seen what the Germans did all through France, and that, to the families, how the families got slaughtered and raped,” Ralph said. “Dad thought that out where we were we were very vulnerable. “If the (Japanese) invaded Australia, the first defence they hit was the ‘Brisbane Line’. When an invasion seemed imminent, Ralph’s father made plans for the family to escape to a property at Devils Nest Mountain on the Great Dividing Range. The land was covered with thick vine scrub, but John built a hut and was prepared to take his family there if the Japanese arrived. 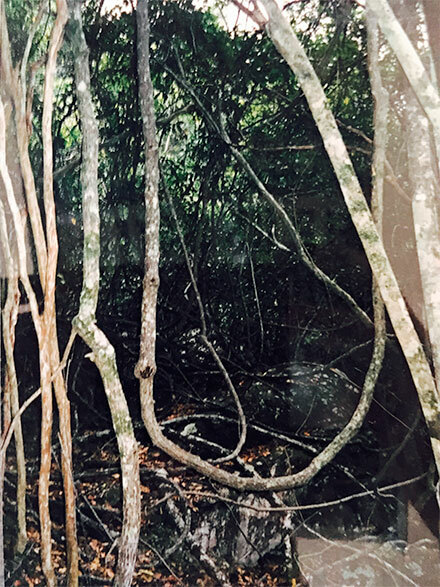 Hiding spot: A vine scrub at Devils Nest Mountain, the area where John Hickey had planned to retreat to if Japanese forces had invaded Australia in 1942, during the Second World War. Ralph recalls his father worked out food and shelter options for a long siege. “First we would stay in the hut he built and if things got worse we could hide in the caves,” he said. The Battle of the Coral Sea was an anxious time for Ralph, with uncertainty and fear ever present. Retelling the story 75 years later, his voice faltered when he started speaking about the relief he felt after the battle. “I’ve just got to thank God the (Japanese) didn’t get us,” Ralph said. After the battle, Ralph felt that his family was safe, but he knew others who did not fare so well. He went to many funerals for schoolmates who were killed in combat. He can still describe each of his friends in detail, from the colour of their hair to the job their father had. Ralph said one of his friends was Bob Cowie, an engineer’s son. “He was a tall, pale-faced academic type,” he said. “He wouldn’t hurt a flea. “When Bob got killed, Mum went down to Mrs Cowie and took me with her. Despite the difficult times, Ralph reaped some benefits. With the men away, he learned to handle a horse and do a man’s work. His skill with horses became widely known and led to one of his closest encounters with the military. Ralph was delivering four horses to a cattle station, riding one horse and leading the others. “I remember taking these horses out and taking the defence road, and the next minute all these trucks came over the hill,” he said. “This might sound naive, but I didn’t know if they were the Americans or the (Japanese) – the horses took fright and I was so busy trying to hang on. The adventures of war prepared Ralph for other difficult times in his life, such as when his wife Barbara had a stroke soon after they were married. But despite all he has been through, Ralph has a positive outlook on life. He said bad times made him a better and stronger person. He referred to his birthday as an example of how a negative situation could always be turned into a positive one. “I was born in 1930 on the 1st of April,” he said. “As a kid, I got called an April fool, but I soon learned that mine was the only birthday that anyone ever remembered. 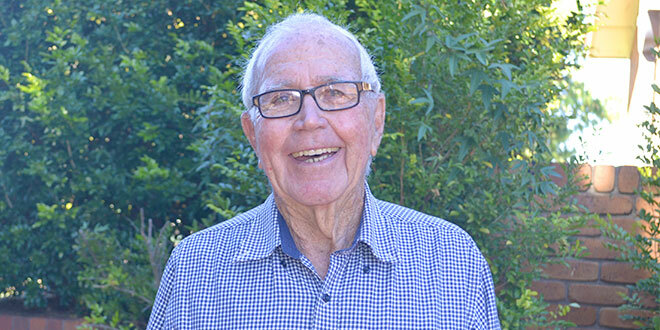 Ralph has remained a faithful Catholic and attends Sacred Heart Parish in Toowoomba. He said he was named after St Raphael, but his father thought the name was too fancy for Theodore so he was baptised Ralph. In addition to the faith, music has always been important. “Music is just my life,” he said. Ralph said he had been retired for nearly 30 years and he planned to live happily ever after.